Republican candidate discusses Israel's right to defend itself. from jerusalem where republican presidential cdidate mitt romney is auditioning for a position on the world stage. This evening we note that election day is now just 100 days from today. This evening romney and his wife ann are having dinner with an old friend, israeli prime minister benjamin netanyahu. Romney and netanyahu worked together years ago. Earlier today romney visited the western wall where he placed a prayer he had written inside the wall. Tonight romney delivering a 1350e67 here in israel saying "we have a moral imperative to deny iran's leaders the means to follow through on their malevolent intentions." Right beforehand he sat down with us. We talked about the threat of iran, the incoming fire from democrats back home over his tax returns and we talked about the all-important debates against president obama, how he thinks the president will perform. Thank you. 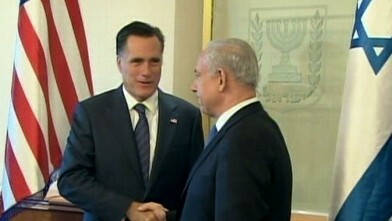 Governor romney, mitt, it's a pleasure to welcome you to jerusalem. Reporter: Calling him mitt, israeli prime minister benjamin netanyahu welcomed an old friend to israel. Netanyahu and romney worked together years ago, and now he's looking to send a message, that matters it at a time when a staunch american ally wrestles with what to do about iran. One of your advisers said you would respect israel's decision to strike iran on its own. Would you support an israeli strike on iran? I think I'll use my own terms in that regard, and that is that I recognize the right of israel to defend itself. At the same time, we are as two nations both committed to employing every means we have to keep iran from pursuing their nuclear folly, and that means every diplomatic course, economic forces, as well. Sanctions are beginning to have a greater impact on iran. Reporter: You talk b Sounds an awful lot like what we hear from the obama administration. Is there a difference? You know, I gave an address five years ago. Reporter: An address in tel aviv outlining what he thought. It's taken a long time for those to be executed. Some are still not executed. Reporter: Like what? Being on foreign soil, i simply don't want to attack the president or his policies nor make new foreign policy. Reporter: He told me he wishes there had been tougher sanctions on iran earlier. As romney makes this trip overseas to burnish his foreign credentials, he knows the politics continue back home. While in london romney reiterated he will release two years and two years only of his TAXES JUST AS john McCain did. We know that there was one year where you paid about a 13.9% tax rate. Can we clear this up by asking a simpes or no question? Was there ever any year when you paid lower than the 13.9% then? I haven't calculated that. I'm happy to go back and look but my view is I have paid all the taxes required by law. I don't pay more than are legally due, and, frankly, if i had paid more than are legally due, I don't think I'd be qualified to become president. I think people would want me to follow the law and pay only what the tax code requires. Reporter: You say you would go back and look. You would look for us? I haven't looked at the tax rate paid year by year. I know that I pay a very substantial amount of taxes and every year since the beginning of my career so far as I can recall. Reporter: The romney campaign has made it clear that no matter how many years they release, it will not stop the obama campaign from wanting more. We also talked london where he and ann went to the opening ceremonies, the swimming competition and, of course, those headlines when he expressed reservations about how well the games would go. If you got a do over, would answer the same way? You know, I tend to tell people what I actually believe and the comments made in the media is something which I felt was an honest reflec of what was being concerned or what was concerning folks. Reporter: And with just 100 days now until the election, romney told us when it comes to the debates, he'll be prepared. Do you think the president is going to be a formidable opponent on that debate stage? Absolutely. The president was a very effective debater in the last round. He's a brilliant orator. I would expect him to be very effective on the debate stage. Reporter: But governor romney also telling me that he believes four years later on that debate stage, it will not be about just words, but about two different courses, two different paths for america to choose from. The governor one on one with us here today. The presidential hopeful outlines how he would handle Iran.